Truth be told, the only time I can catch pictures of the nursery is when my little man is awake, which makes for blurry photos. Please look past the photo quality and onto the awesomeness of the decor! I had this idea while I was pregnant and dreaming of the nursery. Now that I’ve actually created it, I’m so pleased it was better than I hoped! And easy! Very very easy! I collected 4 plastic animals, bought 4 pages of fun scrapbook paper, and 4 frames and ribbon I already had on hand. I took out the glass, taped the paper onto the matte. I wrapped the animals in ribbon and tied a knot. I pulled the ribbon up between the paper and the matte, then taped. I closed up the frame, keeping the glass out, and there you have it! It took team work to get these babies hung on the wall, especially with a lively 12 month old climbing around. There you have it. 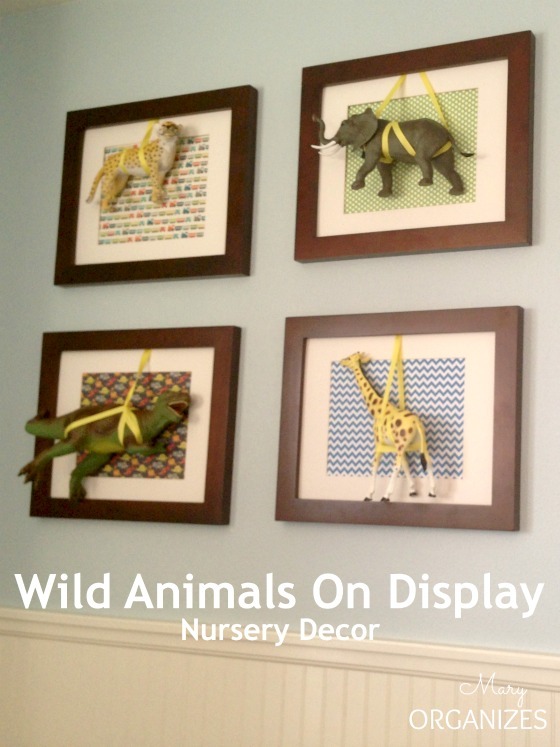 Easy, adorable nursery art. In the next few months I plan to show you all of my children’s rooms, which is something I’ve never done before. I’m excited! Be sure to stay plugged in so you won’t miss it. My Favorite Ways to Clean … because everything gets dirty eventually. Too Kool! Great imagination! Proud of you Mama!! Why don’t you come and see them in person?